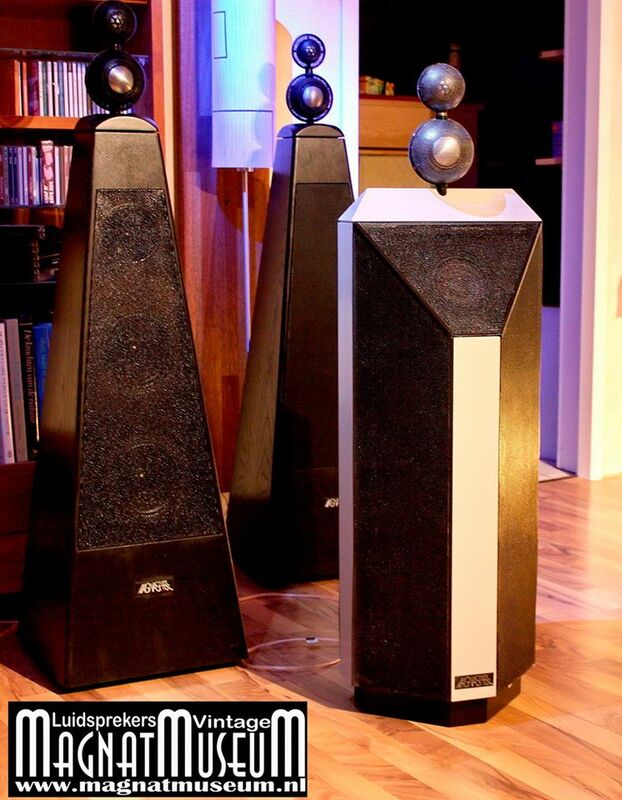 Magnat, a prominent West German loudspeaker manufacturer, is introducing a novel four-way, three-piece speaker system that is claimed to be the first speaker to achieve true omnidirectional sound dispersion. 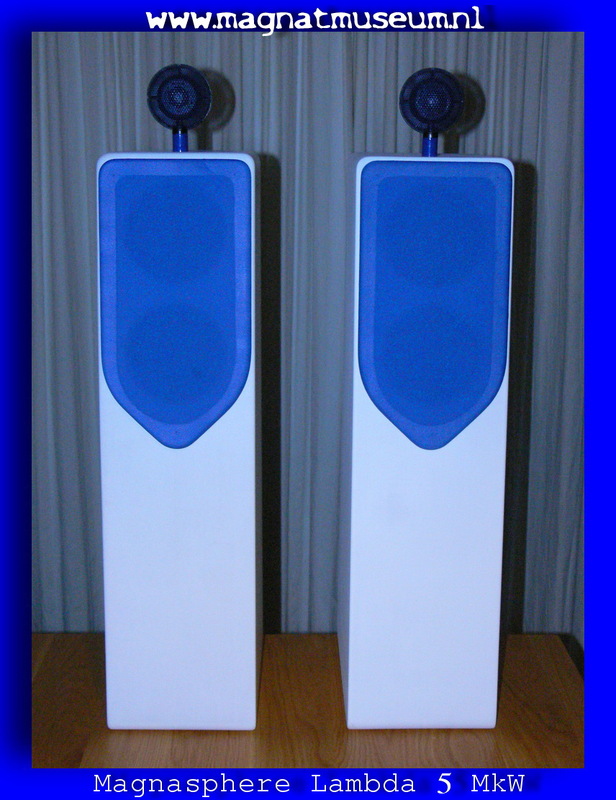 The system supplied to us for test was a preproduction model, as the speaker is not scheduled for release until later this year. 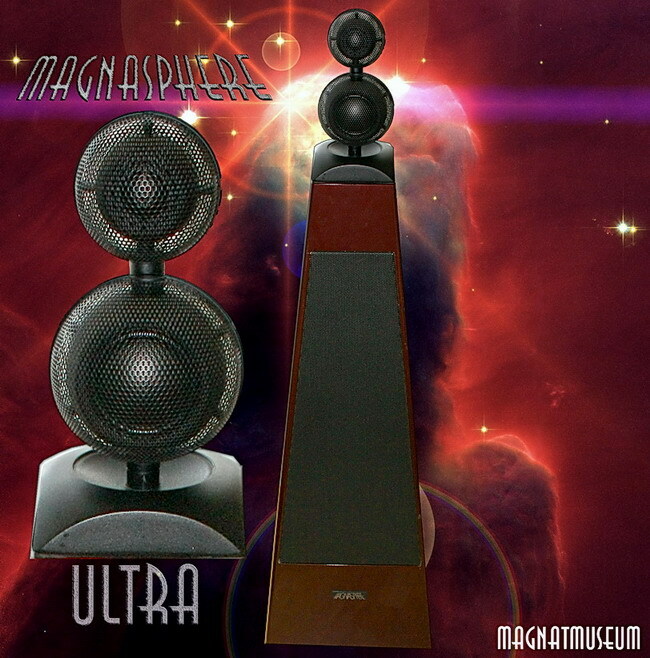 The Magnasphere Nova consists of two satellite speakers and a powered subwoofer module. 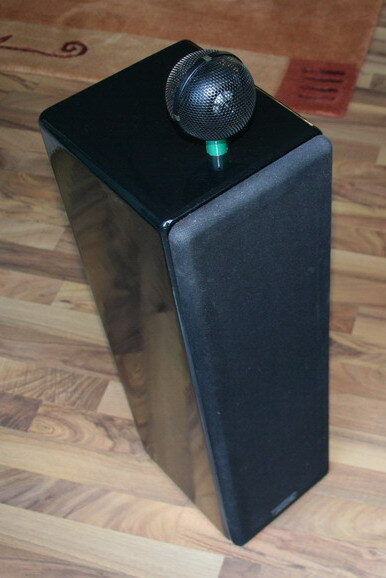 The subwoofer, like similar products in its external appearance, is approximately cubical and has a glossy black piano finish. Its output emerges from slots about 2 inches high and 20 inches long near floor level on the front and rear of the enclosure. The satellites, however, are unique in appearance and design. Each consists of three black, perfo-rated-metal spheres stacked vertically on a slender black-steel column. Each sphere contains a pair of magnetic drivers mounted back-to-back and radiating in opposite directions. Since each driver pair operates in phase, the radiation pattern is approximately the same in all directions except in the plane of the sphere’s vertical “equator,” where the drivers are joined. The bottom sphere of each satellite, the “woofer,” contains two 4-inch polypropylene-dome radiators that operate between 100 and 1,400 Hz. Each dome, constructed of two different thicknesses of polypropylene and mounted in a cutout in a plastic sphere slightly less than 8 inches in diameter, is driven at its 2-1/4-inch diameter by an inner “cone” that has a smaller voice coil at its apex. 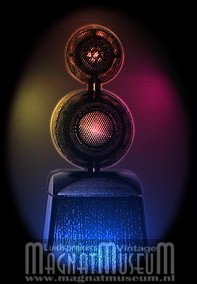 The middle sphere, which radiates from 1,400 to 3,400 Hz, is essentially a smaller version of the woofer sphere. 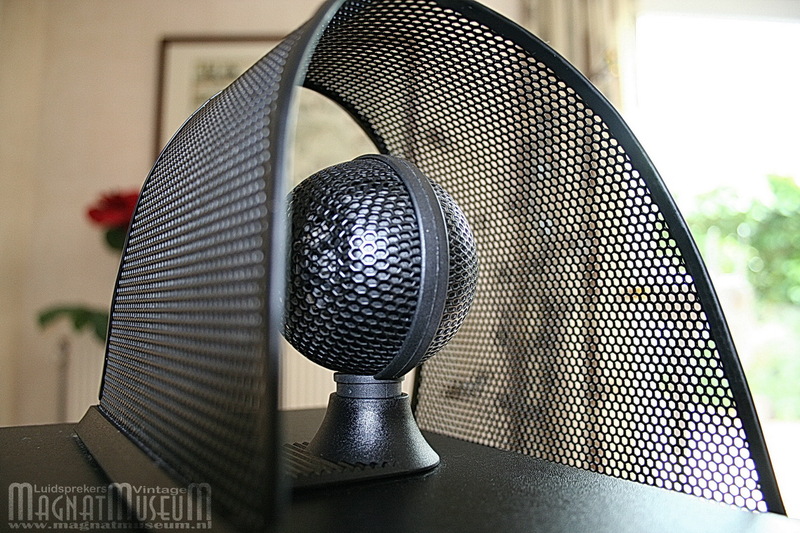 It contains two 2-inch soft-metal-dome radiators mounted back-to-back within a 4-inch spherical case, which in turn is surrounded by the perforated-metal cage. 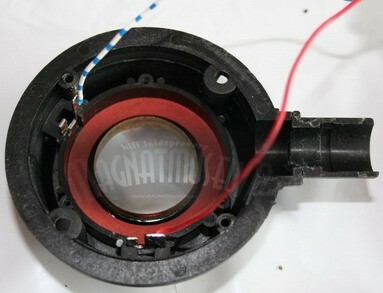 Immediately above it is the tweeter, with a pair of 1-inch drivers in a 2-1/2-inch cage (all these dimensions are approximate). Passive crossover networks for the satellite drivers are located within their spherical enclosures, which are joined by eight-pin DIN connectors. A separate control box contains an active electronic crossover circuit, with a slope of 24 dB per octave, that excludes the low-bass frequencies from the satellites, supplying them to the subwoofer module through a cable and DIN plugs. 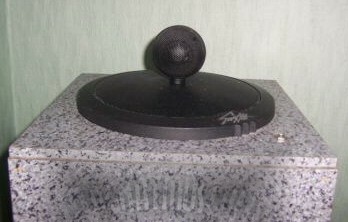 The controller has front-panel adjustments for setting the subwoofer’s output level and the low-bass crossover frequency (either 80, 100, or 120 Hz). An unusual feature of the Magnat system is its time-delay correction. 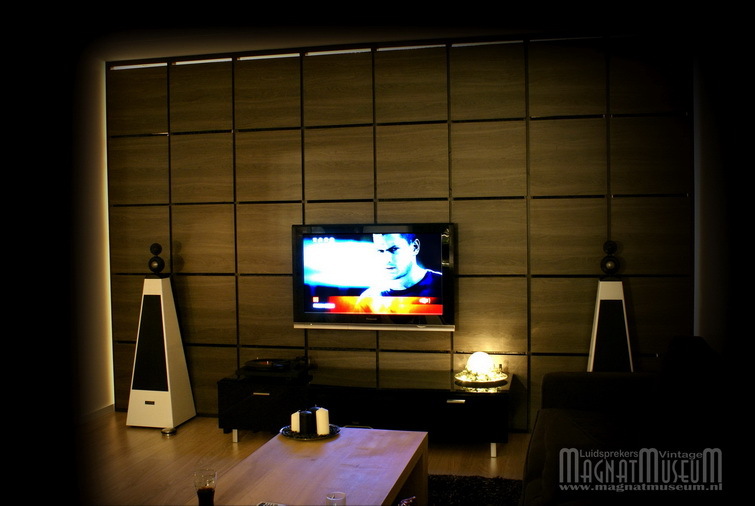 Any three-piece system such as the Magnasphere Nova is very likely to have large time differences between the outputs of its subwoofer and satellites. In part, this results from the placement of these components in the listening room, where they are often many feet apart, and in part from the inherently greater delay in the output of a subwoofer compared with that of a midrange or high-frequency driver. The audible significance, if any, of these time differences has not been established, but the Magnasphere Nova provides a way for the user to compensate for them, if only approximately. The signals supplied to the satellites are routed through a high-pass Bessel filter whose delay can be adjusted for 0, 32, or 64 milliseconds (ms) by a switch on the control unit. 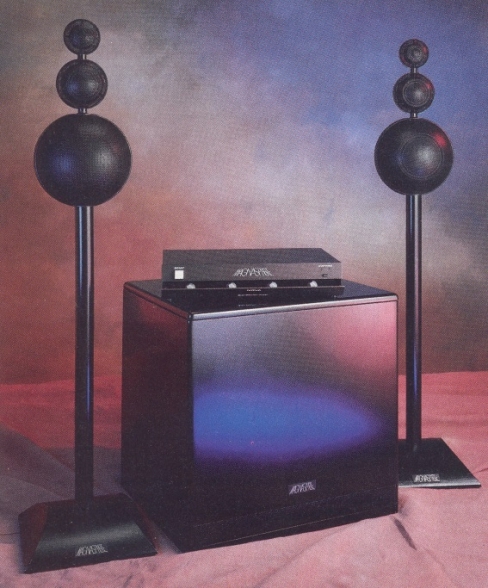 Since typical delay differences in a three-piece system like the Nova will fall in that range, presumably a user could reduce the differences substantially by delaying the satellite speakers’ output by 32 or 64 ms. 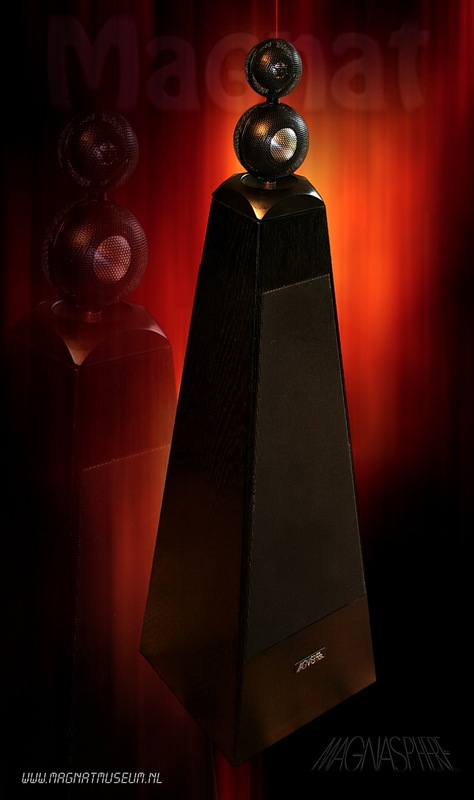 The Magnasphere Nova subwoofer contains four long-throw drivers, each with a cone diameter of 7-2/5 inches. They are mounted in opposing pairs on a board that divides the inside of the cabinet horizontally. 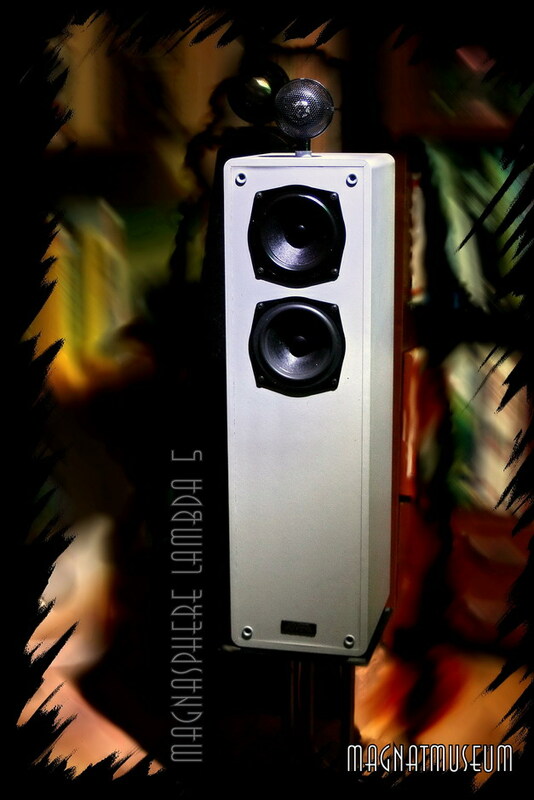 Each pair is driven by the signal from one stereo channel, although the acoustic outputs of all four drivers are effectively combined at the cabinet’s ports. 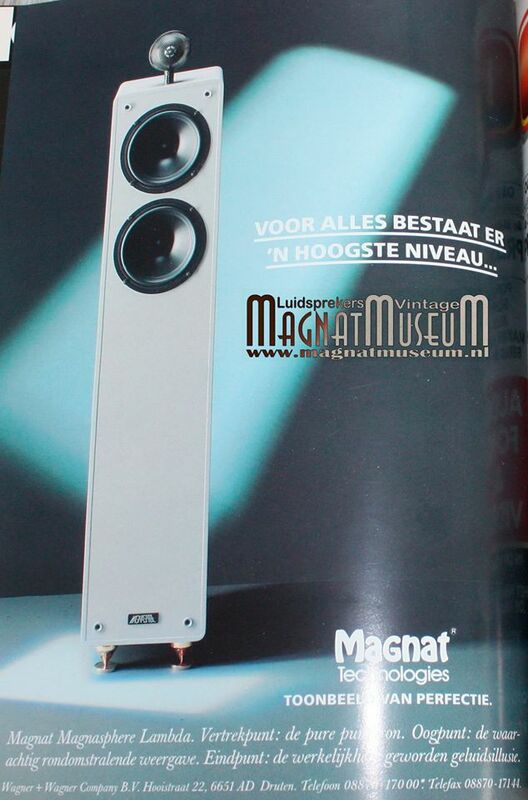 Magnat describes the subwoofer as having a “compound principle” of operation. Apparently each opposing pair of drivers operates in “push-pull” mode, with their cones moving in the same direction, instead of in opposition as in the satellites. The subwoofer’s amplifier, built into the enclosure, is rated to deliver 180 watts per channel continuously, or 500 watts peak output, with less than 0.05 percent distortion. 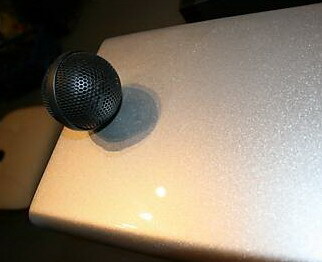 The top of the tweeter sphere is about 47 inches from the floor, the bottom of the woofer sphere about 30 inches. The stands, about 1-5/8 inches in diameter, have black cast-iron bases. Each complete satellite weighs about 28 pounds. 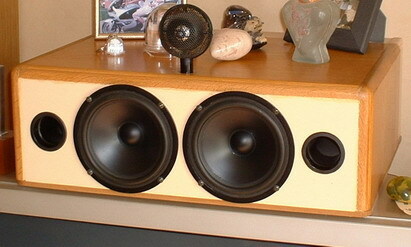 The subwoofer module is about 21 inches wide and high, and 18 inches deep. Although its weight was not specified, we can testify that it is very heavy! The control unit is a black-finished metal cabinet that measures 16-3/4 inches wide, 11 inches deep, and 3-3/8 inches high. Its front panel contains a power switch and a small button that causes a motor to open and close the lower half of the panel, which covers the other controls. The panel also has a pair of overload lights to warn of excessive signal levels. 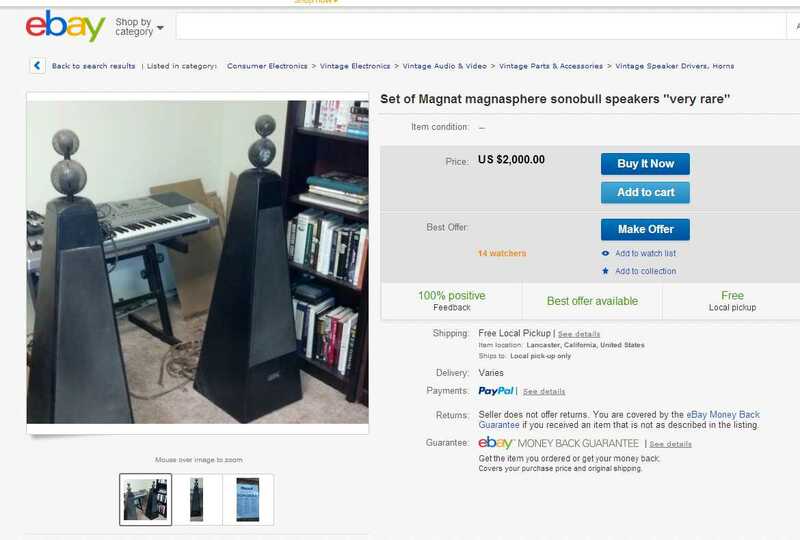 Price: $5,500 (estimated) for the system. Some details of the Magnasphere Nova system, especially the control unit and its specific adjustment ranges, might be changed in the final production models. Since the radiators used in the satellites have been in the Magnat product line for some time, however, they can be expected to remain as described. We placed the satellites about 8 feet apart and 4 feet from the wall behind them. The subwoofer was located approximately on the same line as the satellites and midway between them. We set the subwoofer output level by ear for the best possible bass response without excessive boominess on vocal sounds, and the 80-hz crossover setting was used for most listening and measurements. We tried the other settings as well, but the lowest of the three frequencies generally produced the best results. Our frequency-response measurements were made in the usual way, plotting room-response curves for both satellites on the same chart and averaging them to smooth out room standing-wave effects. We measured the subwoofer’s response with each of the crossover settings, placing the microphone at one of the output slots. Bass distortion was measured at the same point, using the 80-Hz crossover setting. We measured the impedance of a satellite unit, which is the only part of the Magnasphere Nova that is actually driven by the user’s regular system power amplifier, over the full audio frequency range. The system’s sensitivity was measured at a 1-meter distance, with only one satellite operating, using 2.83 volts of pink-noise input. Since there is no fixed relationship between the signal input level and the subwoofer’s acoustic output (their relative levels are set by ear), we measured the drive signal needed to produce a 90-dB sound-pressure level (SPL) at a 1-meter distance from the subwoofer slot at 50 Hz (on the flat portion of the subwoofer’s frequency response) and then maintained that same input level from 100 Hz downward when measuring bass distortion. Our quasi-anechoic FFT response measurements with the IQS signal-analysis system were made 1 meter from a satellite. 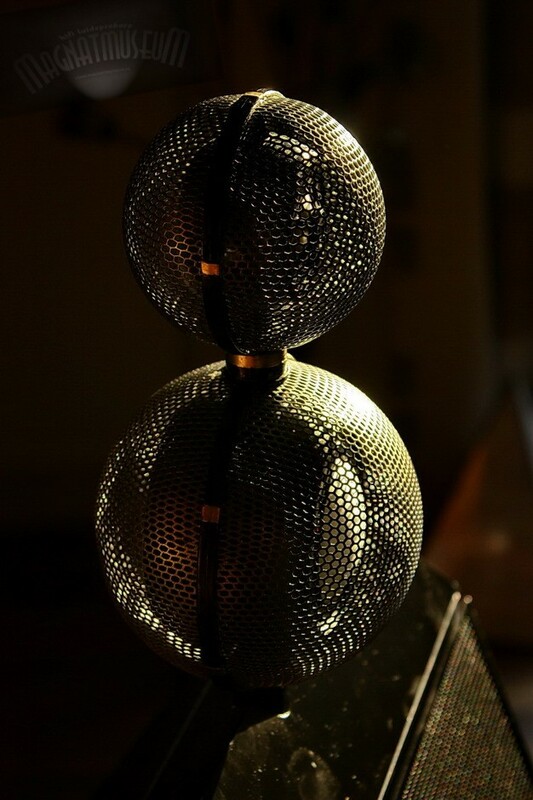 With the microphone close to each of the spheres, we also measured their individual frequency response on the forward axis and at 45 and 90 degrees off-axis (the latter angle is close to the solid band that unites each pair of hemispheres). Plotting the axial and off-axis response curves on the same printout enabled us to assess the actual directivity of each section of the satellite speaker. In addition to our usual group-delay measurements, applied to a complete satellite array, we made a group-delay measurement on the output of the subwoofer alone. The satellites’ combined room response was very uniform, ±3 dB from 200 to 20,000 Hz, indicating a relatively flat acoustic power-output characteristic. Below 200 or 300 Hz the response became irregular because of room reflections. The close-miked subwoofer response was flat within ± 2 dB from 25 to 80 Hz using the 80-Hz crossover setting; the upper limit extended to 110 and 140 Hz with the 100- and 120-Hz settings, respectively. 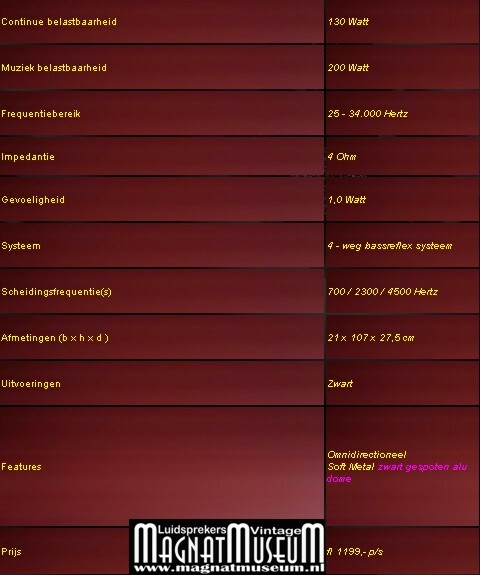 From 30 to 72 Hz, the subwoofer’s output varied only ± 1 dB. Splicing the Nova system’s bass and room-response curves was not as easy as it is for most conventional single-cabinet speaker systems. 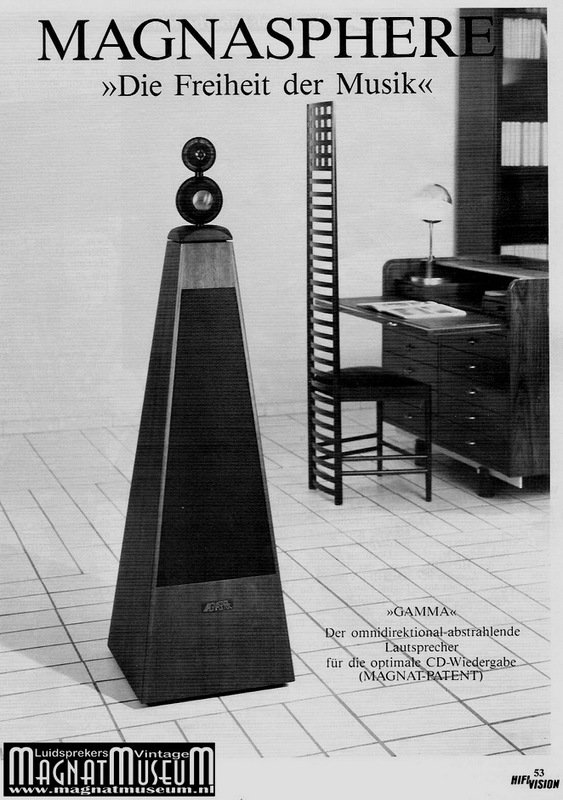 The reference level of the bass curve could be placed almost anywhere relative to the room-response level, and the room’s standing-wave effects eliminated the usual clues to the relationship between the two. We finally joined the curves with the flat region of the subwoofer response at the same level as the smoothed satellite room response, which left the region from 100 to 200 Hz undefined. Since this frequency range is strongly affected by speaker placement and room dimensions, our choice was not unreasonable. The other parts of the curve give a fair indication of what the Magnasphere Nova system itself is capable of. The composite response, which had only a few minor irregularities, varied ± 3 dB from 23 to 20,000 Hz. The bass distortion was between 2 and 3 percent from 25 to 100 Hz, climbing to 8.5 percent at 20 Hz. The distortion consisted entirely of second and third harmonics. The impedance of a satellite, using the 100-Hz crossover, varied between 3.7 and 7 ohms over the range from 200 to 20,000 Hz (the nominal system rating is 4 ohms). The impedance rose smoothly below 200 Hz, to about 60 ohms at 20 Hz, reflecting the isolation provided by the system’s crossover network. The system’s sensitivity appeared to be rather low, with each satellite producing only 80 dB spl at 1 meter with a drive signal of 2.83 volts of pink noise. This figure does not include, however, the considerable contribution of the subwoofer at frequencies below 100 Hz. In actual use, the system did not require an unusual amount of drive power even at very high levels. The fft measurements were consistent with our other results. Since they extended beyond our usual 20,000-hz measurement limit, they confirmed that the satellites’ high-frequency response was virtually flat up to about 27,000 Hz. One of the more interesting fft measurements was the group-delay response to the subwoofer, which averaged about 30 milliseconds from 35 to 95 Hz and increased to 70 ms at 20 Hz. This suggests that the optional delay compensation in the Nova’s system controller could, in theory, correct for much of the difference between the subwoofer’s delay and the typical delay of less than 0.5 ms across the rest of the audio range that we measured from the satellite output. The fft measurements also proved that the spherical radiators are not really omnidirectional, although their effective dispersion is wide enough to give them many of the subjective qualities of an omnidirectional radiator. A close-miked measurement of the tweeter sphere at angles of 0 and 45 degrees off its forward axis showed that the two response curves differed by 3 to 6 dB over most of the tweeter’s operating range. Although this is good dispersion, the response at 90 degrees off the forward axis was down more than 20 dB over most of the range. As would be expected, the midrange radiator was better, with less than 3 dB separating the axial and 45-degree curves over its full operating range. 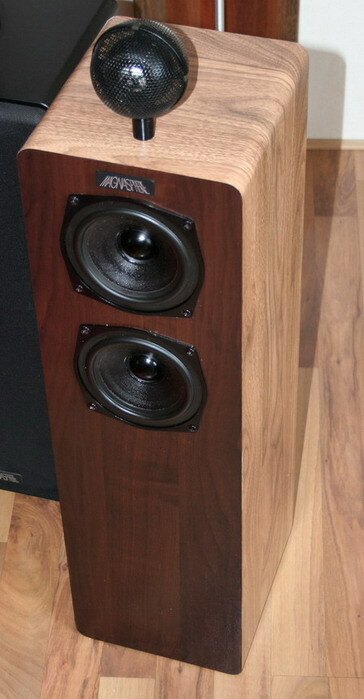 Still, the midrange output at 90 degrees off-axis was typically 18 to 20 dB below the axial level. 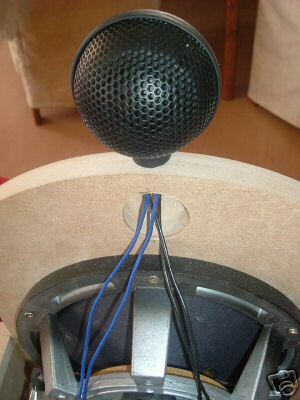 The woofer sphere showed virtually no response change over the first 45 degrees, but at 90 degrees it was a uniform 12 dB down over most of that driver’s operating range. 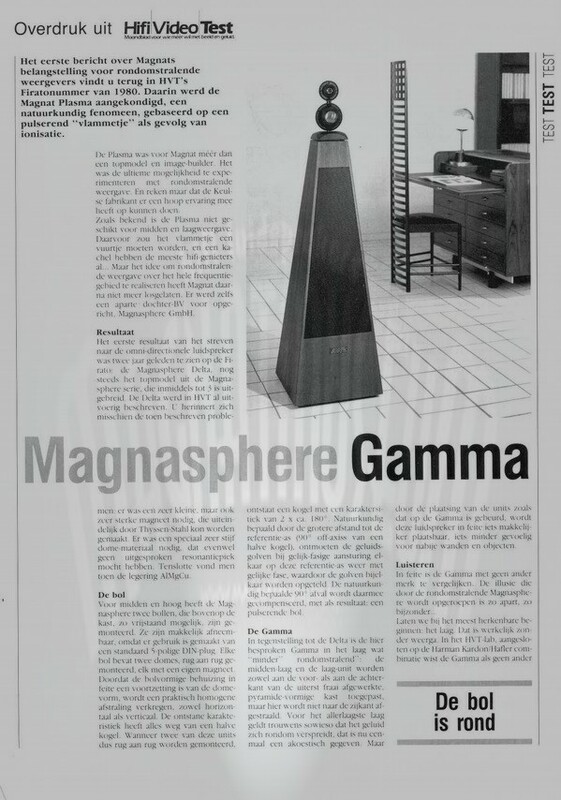 The Magnasphere Nova system was a very “listenable” speaker. The sound from the satellites seemed to float in the air, with no clues to its origin as long as we were a few feet away from the speakers. It not only filled the space between them but extended behind and above them as well. We were unable to hear any difference in the sound as a result of switching the delay compensation between 0 and 64 milliseconds, but there is little evidence to show that bass delays in that range are audible. While this feature looks promising in principle, it may be of little practical value. The subwoofer, of course, cannot be located by ear, although it is certainly obvious to the eye. Too much subwoofer output can make some programs bottom-heavy, and we chose what seemed to be a reasonable level for our listening tests, setting the bass control at less than half of its maximum rotation. Even this middling level produced a solid, almost tactile deep-bass output with suitable program material. We soon found that listening to the Magnasphere Nova tends to distract one from trying to dissect and analyze its sound output. That is a characteristic of most very good speakers, and the Nova is unequivocally one of the better-sounding ones we have heard. Our only clear disagreement with the claims made for the Magnasphere Nova concerns its supposed “omnidirectionality.” The satellites are really sets of three dipole radiators, with virtually no radiation to the sides and equal outputs front and rear. They have the audible qualities of a good dipole and are much more compact than most. Whether you find them attractive as home furnishings is a matter of personal taste. And they are certainly expensive. 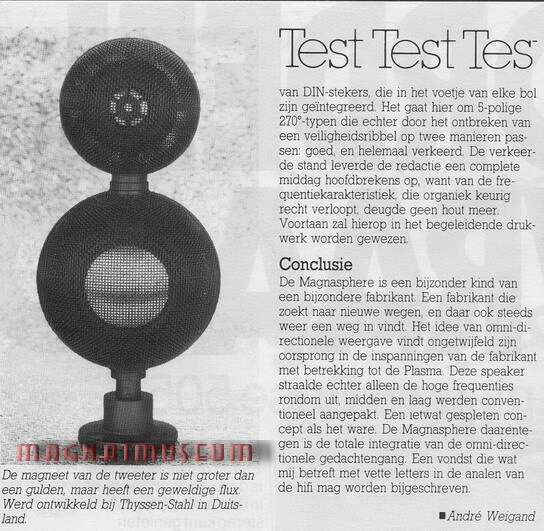 But in the final analysis, it is the sound of a speaker that justifies its cost, and Magnat’s Magnasphere Nova system passes that test beautifully. Andromeda Galaxy Double-Nucleus, Painting by Adolf Schaller based on Hubble Space Telescope observations by Tod Lauer, et al. 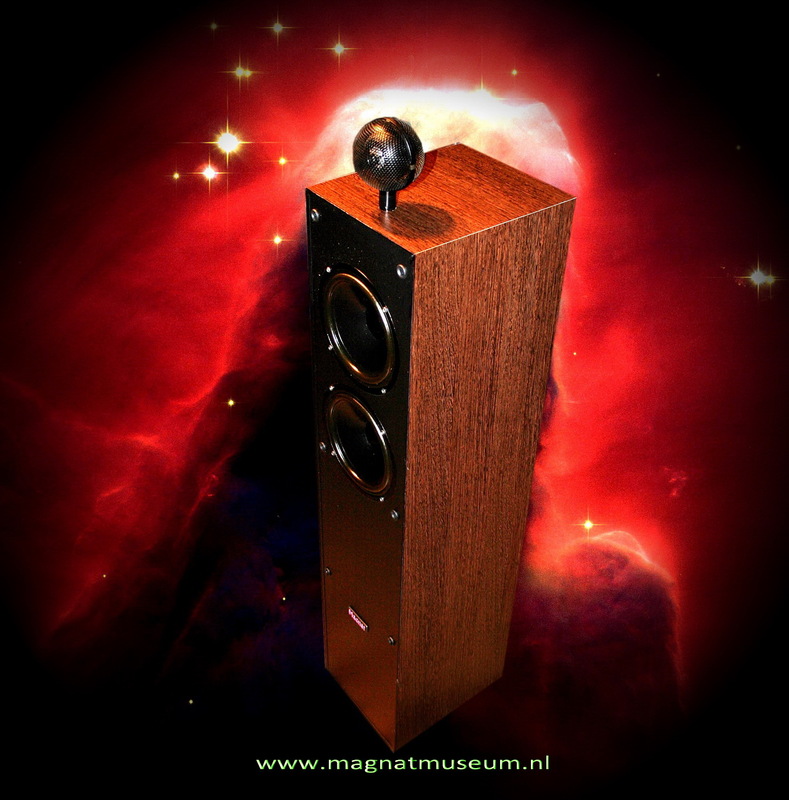 Een trotse bezitter van de legendarische Magnasphere Gamma speakers. Zo’n 20 jaar geleden liet mijn oom een stel eigenbouw luidsprekers maken. De inhoud van een All-Ribbon 7p werd in een eigen ontwerp geplaatst waarbij de middentoner en de tweeter apart in een kast los van de basluidspreker werd gemonteerd. Na het luisteren van Tracy Chapman was ik meteen verliefd!……..
Niet op Tracy natuurlijk maar op het geluid wat uit deze luidsprekers kwam…………. Zo ontstond de liefde voor het “oude” Magnat. Helaas had ik in die tijd geen geld om dit ook voor mijzelf te laten maken. Goed ik was dan ook een jaar of 8. Tien jaar later had ik redelijk wat bij elkaar gespaard en kwam ik mijn setje Gamma’s tegen. Deze set Gamma’s zijn een van de laatste die gemaakt zijn geworden, en hebben zwarte tweeters! Wel is het zo dat de gamma’s wat rustiger zijn in het midden en hoog maar juist wat meer open geluid geeft, ook is de bas wat minder vet is dan de luidsprekers van mijn oom. 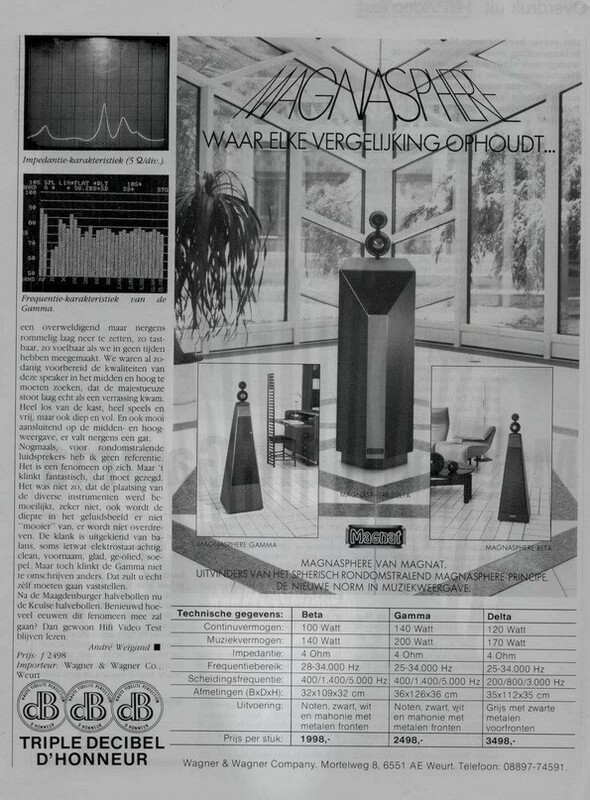 Echter is het geluid van deze speakers super. Het mooiste is dat ze in een niet alledaagse kleur zijn en dus nu nog steeds een van de meest tijdloze luidsprekers zijn. Ze staan zowel in een klassiek interieur als modern interieur goed op hun plaats. Toen ik deze speakers net had heb ik deze aangesloten gehad op een van de meest verschrikkelijke versterkers aller tijden. EenJVC RX7000. Wat een prul was dat zeg. De complete dynamiek van deze speakers was weg en gaf een erg geknepen geluid. Gezien het feit dat ik ook graag naar films kijk ben ik op zoek gegaan naar een versterker die zowel muziek (stereo) als Film (surround) goed kon weergeven. Dat was een heftige klus. Uiteindelijk ben ik uitgekomen op een Denonversterker de AVC-A10se. Voor de mensen die er enig zicht op hebben….een van de weinige surround versterkers die ook goed presteert in stereo modus. Dit was op 1 na het topmodel van Denon en dus ook niet op elke hoek van de straat te verkrijgen. De meeste versterkers worden nu niet meer zo stabiel geleverd. Verder heb ik een Denon super-audio speler en een Project platenspeler aangesloten. Voor mijn TV heb ik een MediaCenter in elkaar gebouwd hier staan voornamelijk FLACbestanden op omdat MP3 niet om aan te horen is. De VectorSphere 6 is een Vector 6 met keuze voor de originele tweeter of boltweeter. Door de bol te gebruiken die dezelfde eigenschappen heeft als de T-25 tweeter krijg je een veel breder geluidspectrum. Wat het stereo beeld ten goede komt. Rondom in het hoog. Vooral dat de bol tamelijk hoog zit komt het geluid nog beter los hoe gek het ook klinkt, maar het ziet er niet fraai uit……..
Ook de kast vol met dempingmateriaal gestopt waardoor de bassen strakker klinken en niet te overheersend worden weergegeven. Het luistergenot wordt door deze maatregel belangrijk verstrekt. De Vector 6 gaf te veel laag wat gaat irriteren op den duur. Tenzij je van veel laag houdt dan doe je niets aan de kast. Ze gaan heel diep in het laag met de CD van Paul Hattink 5. Features Dubbele basspoort achterzijde – enkele baspoort frontzijde = Bi-wir. Door een schakelaar op het achterpaneel is het mogelijk om de boltweeter of de T-25 tweeter te gebruiken. Heel mooi setje omgebouwde Lambda 10. Dat is veel werk geweest om ze zo te krijgen. Is wel te dicht geplaatst vind ik. Bij de VectorSphere is de bol extra hoog geplaatst en dat geeft een nog ruimtelijker effect. Het laminaat verwijderen is een stevig karweitje, maar met een verfbrander kom je een end. Deze set is gespoten in metalic zilver (mercedes) kleur. Verkaufe meine High End Lautsprecher, die besten die ich je hatte. Habe sie vor ca. 1 Jahr neu bei Mercedes in Silber Metallic lackieren lassen. Alle Sicken (Gummiringe) und die beiden Kugeln wurden erneuert. Auf der Rückseite habe ich eine Einstellmöglichkeit für die Hochtöner eingebaut, um die Vorderabstrahlung anzupassen. Durch die nach vorne und hinten abstrahlende Kugel wird ein unheimlich räumlicher Klang erzeugt. System: 3 Wege omnidirektional (Hochtöner mit Vor- und Rückabstrahlung, zwei Mittel-Tieftöner im Gehäuse, sowie indirekte Tiefbass-Abstrahlung). 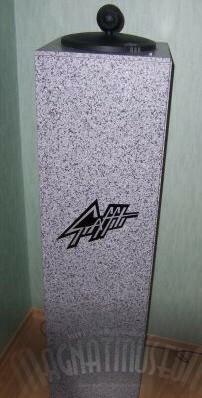 Bin der Erstbesitzer dieser Lautsprecher und hatte sie um 1990 gekauft, jetzt liebevoll wieder aufarbeiten lassen. Zum Zustand des Gehäuses lässt sich sagen, daß der Silberlack natürlich der absolute Hingucker ist. Bis auf wenige Stellen ist der Lack wie neu. Beim Spachteln hätte man vielleicht noch etwas besser arbeiten können. Fällt aber kaum auf – siehe Bilder. Probehören ist ausdrücklich erwünscht und wird auch sie verzaubern. Einfach unwahrscheinlich was da für ein warmer, kräftiger und rämlicher Klang rauskommt. Mehrfacher Testsieger – Bewertung Weltklasse – Testzeitschrift müsste ich noch haben. Magnasphere Graffiti 2 zijn speciaal ontworpen voor in de auto. Heel kwetsbaar en eigenlijk niet te gebruiken in een auto. 1 paraplu is al voldoende voor afbreken bol. Werd de bol van de Lambda 3 voor gebruikt. Werd geleverd compleet met draad filter en aansluitblok. Zal de prijzen nog gaan opvragen. Magnasphere Graffiti Performance 1 is speciaal ontworpen voor in de auto. Wel heel kwetsbaar en eigenlijk niet te gebruiken in een auto. Viva 33 met een heel eigen klankbeeld. Heel open van klank en een rustig geluidsbeeld. Een van de weinige Magnat’s die met klassieke muziek overweg kan.
Dat door zijn heel open middengebied en rustig laag en hoog. Viva 22 is een tussenweg……..
Deze wordt over de bestaande connector heen geschoven. Ideaal voor de ander Lambda’s om zelf te maken. Eindelijk minder zorgen om afbreken. Ook de kap zorgt voor extra bescherming tegen aanraking. Met zwart gespoten soft metal domes. Zoals de Viva 11 die het paarse logo heeft. Viva 22 heeft weer de grotere bol dan de 11. Verwijder het logo als het eenmaal is aangebracht niet. Om te voorkomen dat de pootjes afbreken. Kan eraf maar dan heel voorzichtig allebei de pootje van het logo eruit tikken. De onderste gaat makkelijker, maar ook weer met beleid. Heeft u nog logo’s over geeft u mij dan een mail. *Dat wil zeggen dat er anders gefilterd wordt. bass reflex poort aan achterzijde. De Ultra is werkelijk een unieke speaker. Ziet er niet alleen heel mooi uit , maar klinkt gewoon heel goed!!!!! De Ultra heeft twee uitvoeringen de zwarte gespoten domes en de alu domes. Ik heb nu de hele range gehoord van Beta – Gamma – Ultra – Delta en Nova, maar dit is echt veruit de beste in mijn oren. Dacht altijd dat de Delta het mooist was, maar dat viel in het hoog en midden toch wel tegen. De Ultra is ook veel later gekomen dan zijn broertjes. Het schitterende filter bepaald toch het geluid blijkt nu. Heel mooie vormgeving van de Beta – Gamma – Ultra maken beoordelingen wat lastiger. Het oog wil ook wat, maar als je gaat luisteren naar de speaker dan vallen er wel wat dingen op . Het laag is rustig en diep en gaat echt diep bij zeer lage frequenties voel je de druk alleen. Midden gebied is heel mooi zacht iets romiger dan de Gamma, omdat de voorbol anders uitstraalt dan de 50% van de Gamma krijg je een heel breed stereobeeld wat plaatsing van instrumenten zo mooi maakt. Een speaker waar je uren naar kan luisteren zonder moe te worden. Ze zetten een laag neer waar de Zero 9 MSP-300 een punt aan kan zuigen. Zo mooi strak en diep, het lijkt wel of er een high end sub mee staat te spelen. En dan dat magische hoog……..pffffffffff. Zo helder en transparant elektrostaatachtig……. Kortom een hele bijzondere speaker………..
Heb je een nachtje slecht geslapen, zet de compact disk van Vangelis “Ocean” of “Theme From MIssing” op en droom weg………………… en voorkom een burnout…..
Minder is de forse prijs wat er gevraagd wordt. Zeker dat er bij dit soort speakers nog tamelijk veel werk aan zit om ze weer top te krijgen. Voor de Ultra ben je al snel veel euro’s kwijt voor een goed werkend model. En ze worden zeer zeldzaam aangeboden en er mankeert wel wat aan houd daar rekening mee bij aankoop. Deze set is weer in nieuw staat……….. al zeg ik het zelf. 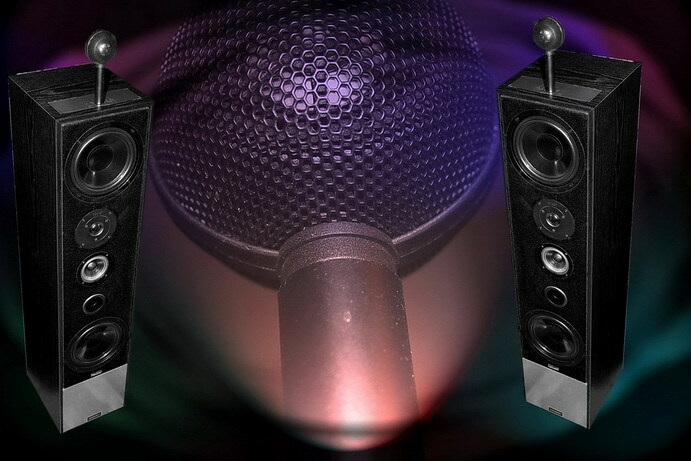 Test op de JVC AZ-911 Digital / PMA-900v versterker met Onkyo CD speler/TEAC – ZD-3000!!! Ultra met drie woofers aan de voorzijde en 1 woofer aan de achterzijde met bass reflex poort aan achterzijde De Ultra is werkelijk een uniek speaker. Ziet er niet alleen heel mooi uit , maar klinkt gewoon heel goed!!!!! Dit exemplaar met de zwarte gespoten domes . Zoals u ziet is de connector gescheurd en er is een pen afgebroken. Dus vervangen is de enige oplossing. Probleem is dat je er niet bij kan komen, maar ik heb een oplossing gevonden. Met een plamuurmes en brede beitel. De connector kan kapot zijn. Dat gebeurd in 9 van de 10 gevallen samen met de houder scheurt de heleboel kapot. Bij dit model waren de draden verkeerd aangesloten. 1 middenbol deed het heel zachtjes en geen hoog. Filter Ultra Midden en hoog gebied op het filter. Bruin is voor hoog en groen is het middengebied. Normaal is altijd groen hoog en bruin midden…. De Ultra straalt 75% voor En 25% achter geluid uit. De zwarte draad is 25% + De blauwe draad is 75% + De gele draad is de – Ik heb laatst een originele Ultra gerepareerd en daar straalt de voorste middenbol meer af dan achter, dus het hoort origineel zo. Ik heb dat ook met mijn eigen set geprobeerd maar vond dat niet mooier klinken sterker werd er minder van. Dus bij mij is het 75% achter en 25% voor!!!!! De zwarte Delta’s zijn met hun 5 woofers aan de frontzijde en 1 aan de achterzijde toch wel even anders. Het laag is nog strakker (mede door de behandeling van de woofers) en op lage levels zeer goed te horen en te voelen…..
Het klankbeeld is voller door de extra laag impuls. Geweldig hoe deze woofertjes hun best doen. Het glas van de deur woonkamer zie je heen en weer gaan zonder laag te horen. Dat gaat dus heel diep……………. Hoog heb ik aangepast door een bol van de Lambda 5 te gebruiken. Dit geeft extra spetterend hoog zoals de MHTL-26F vergeleken met de MHTL-26FF of M.
Ook het filter is anders dan van de Grijze Delta’s, maar de highsphere maakt het plaatje. De originele highsphere’s zijn wat matter en daar houd ik niet van. Heerlijk crispy zodat je ook alles hoort tot de nagels van de gitarist………. Deze Delta vind ik nog beter (al hoe wel de verschillen minimaal zijn) dan de Ultra’s. Als de woofers minder kwetsbaar waren en Fronten anders gemonteerd waren zou dit de Topper van de magnasphere serie zijn………………. Om problemen te voorkomen is het beste om de Delta van zijn jas te ontdoen en de woofers met loden ring opnieuw te lijmen en een dun laagje siliconenkit over de rand te smeren. Zoals op foto 2 te zien is raakt de ring los. Dus pak alle woofers en je bent weer klaar voor de komende 20 jaar. Extra voordeel merk ik dat de bassen nog dieper worden, maar dat kan ook verbeelding zijn…. Lastig om uit elkaar te halen. Connector weer anders geplaatst dan de andere magnaspheres!!!!!! 6 kleine woofertjes die giga laag kunnen weergeven. Zwarte 5 frontzijde en 1 rear. Grijs 3 front en 3 rear. Makkelijke aansluit klemmen, aan de achterzijde onderaan. De Delta’s zien er in het echt stukken beter uit dan op de foto’s. 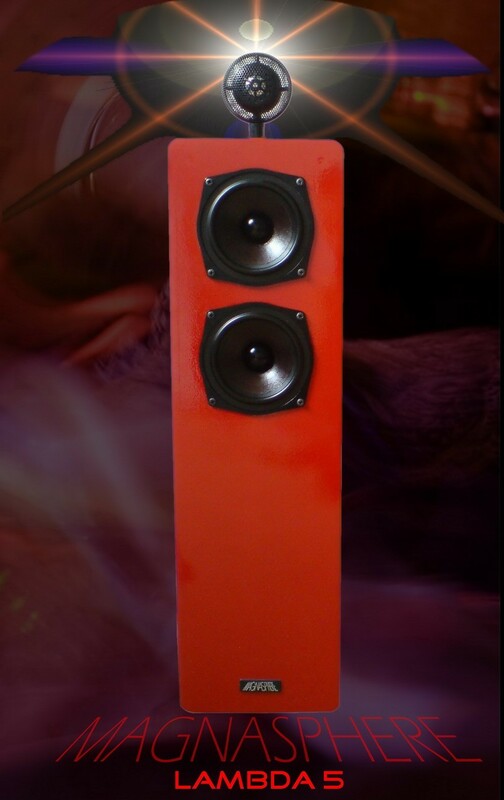 Het mooie zachte grijs met de zwarten fronten straalt toch iets uit dat we te maken hebben met niet zomaar een speaker……..
De Delta met zijn 6 woofers iets heel aparts. Welke woofer erin zit twijfel ik nog aan, want de fronten zijn heel lastig te verwijderen. Dacht dat er de MC-120 die ook en de andere sets wordt gebruikt. 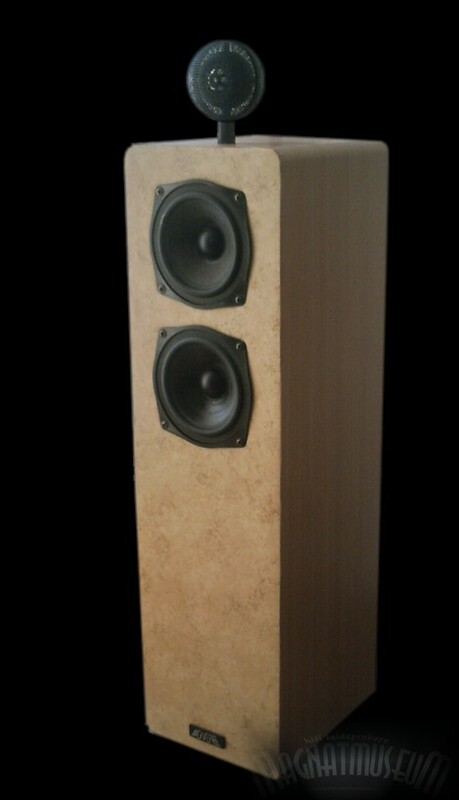 Deze woofer is wel anders van opbouw dan de andere MC-120 serie op de MA versie na. Heeft een grotere stofkap en loden ring. Het laag is vol van klank. Bij CD’s met mindere opname techniek heb je daar wel voordeel van. Het gaat heel diep en heel een stevig volume. Net als de Ultra’s die iets rustiger en strakker zijn. De midden en hoog bol straalt hetzelfde als de Beta-Gamma en heeft ook dezelfde klankkleur. Heel rustig en warm en relaxed. De Delta van Ron was minder in het hoog en midden dan de Museum versie. Ik heb van een andere Delta liefhebber gehoord dat de bollen soms minder gaan klinken. Er is ook een Delta versie volgens John die 5 woofers aan de front zijde heeft en 1 aan de achterzijde. De zwarte Delta’s op de foto zijn dat. Ook de Delta’s hebben kwetsbare bollen en gaan ook vaak stuk, maar alles is wel te herstellen. De connectors zijn redelijk beschermd, maar de bolhouder is extra kwetsbaar. Het is niet buigen of barsten bij aanraking , maar knak…. 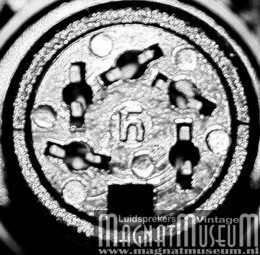 De connectors zitten steviger opgesloten dan de andere Magnaspheres. Klassiek wil ook wel op de Delta. Zijn best wel zwaar en geven ook een gevoel dat dit toch wel iets heel bijzonder is. De Delta heeft een magische uitstraling in het echt , op de foto zien ze er niet mooi uit, maar in het echt met dat zwart en grijs fantastisch wat een ontwerp. De Delta vorm komt overal te voorschijn in het ontwerp. Zeer solide klankkast en een uniek laag. Filter is wel wat aan te doen om de boel beter te laten klinken, maar ik ben heel tevreden met het geluid tot nu toe…………. Alleen is de prijs minder 2e hands……………. 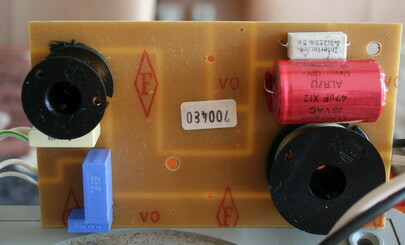 PMA-900v versterker met TEAC ZD-3000 CD speler. MHTS-01 De blauwe draad is de PLUS De gele de MIN Allebei de domes stralen 50% uit. Twee maal 8 Ohm Let dus goed op welke kleuren gebruikt zijn!! 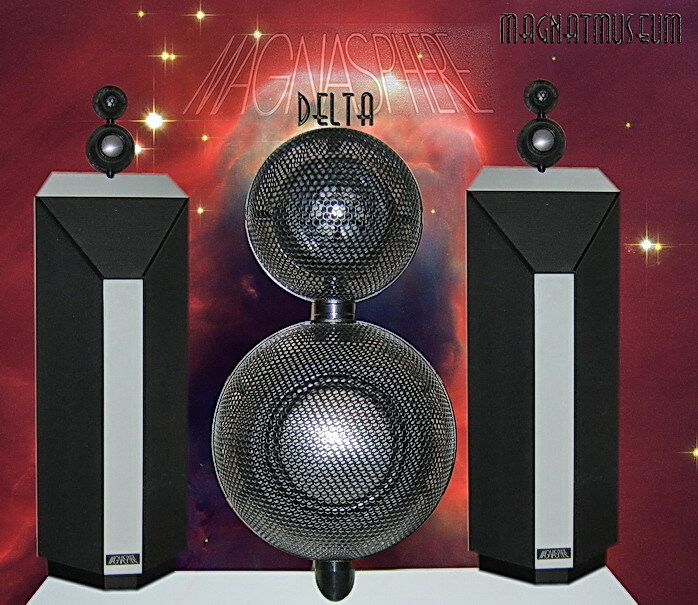 MC-120 zitten in de Delta 6 STUKS…….. Is een speciale woofer met een loden ring onderaan de conus gelijmd. Lijkt wel een loodje op een velg van een autoband alleen is dit een ring. Let op deze ring laat wel eens los en kan veel schade toebrengen aan de woofer!!!!!!!!!!!!!!!!!!!!! Middenbol gaas verwijderd. Gaas is te verwijderen met lijm oplosser. Insmeren en laten inwerken en het gaas komt los, zodat je de dome goed en veilig kan schoonmaken. 6 kleine woofertjes die giga laag kunnen weergeven. Midden gebied is heel mooi zacht. “Wat dan opvalt is dat de Gamma een heel zacht en rustig klinkende speakers blijkt te zijn waar je uren naar kan luisteren zonder echt moe te worden. Heb je een nachtje slecht geslapen, zet de compact disk van Vangelis “Ocean” op en droom weg…………………Mijn persoonlijke ervaring met de Gamma is toen ik mijn eerste vriendinnetje in 1987 weer ontmoette….Ik draaide voor haar Barbra Streisand – Somewhere en elke keer als dat nummer hoor dan zie ik de Gamma en stromen de tranen……….Dus Gamma is niet voor mij wat zeg ik, maar emotie. Het laag van de Gamma is geen diep laag wat we gewend zijn van de bijvoorbeeld de 8p en 10p en MSP-300. Daar is weinig aan te doen denk ik. De Ultra heeft laag wat hetzelfde is als de Zero 9 en MSP-300. Dat komt hoofdzakelijk door de bass-poort die aan de achterzijde zit van de Ultra en de Ultra heeft twee ViFa woofers aan de frontzijde en geen aan de achterzijde. De Gamma is totaal gesloten en heeft 1 laag-woofer voor en achter. 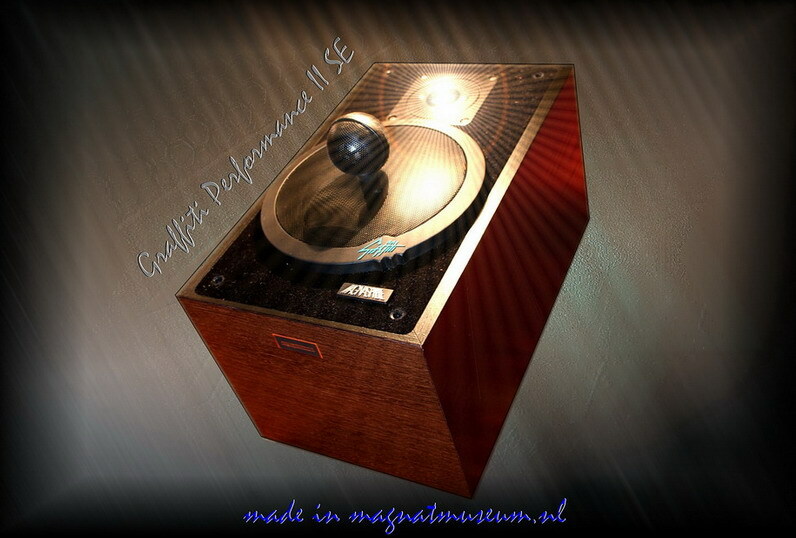 De MSP-300 heeft dezelfde woofers als de Gamma en is ook gesloten en heeft dan wel die hele diepe bas………maar heeft wel een grotere klankast dan de piramide……..heeft Dino er een antwoord op???? De Gamma is veel rustiger en klinkt in mijn oren mooier dan een Zero 9. De Gamma gaat nooit vervelen. 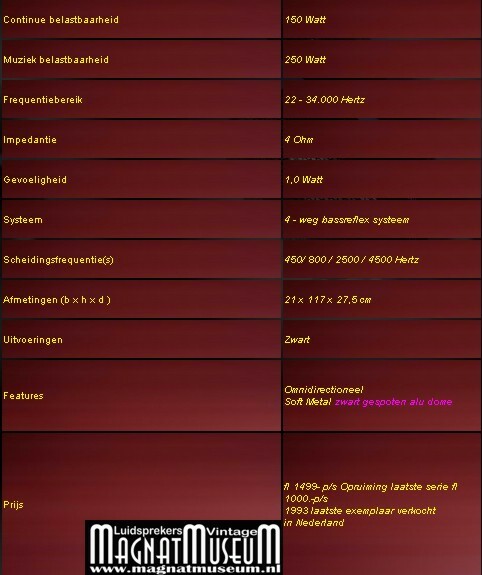 Dus dan begrijpt u dat ik heel blij ben met de Ultra deze heeft alle kenmerken van de MSP-300 en Gamma te samen, maar de Gamma lust ik ook wel pap van.Test op de JVC AZ-Digital versterker met Onkyo CD speler. Magnasphere Gamma is de tweede Magnasphere die op de markt kwam. Aansluitpunten zitten onderaan de speaker die op 4 klosjes staat. Geen geweldige aansluitblokjes en een beetje onhandig gedaan. De Gamma heeft ook aan de achterzijde een midlaag luidspreker, waardoor er een mooi diepte beeld ontstaat. De Beta heeft alleen aan de voorzijde op de bollen na. Voor ruimte tot en met 35 m2 en een krachtige versterker is nodig. Plaats de speaker een meter uit de kant voor een nog ruimtelijk geluid. iets moeten worden aangedraaid, maar wees voorzichtig er mee. De bollen kunnen worden schoon gemaakt. Denk hierbij om de clipjes deze springen zo weg en reserve zijn er niet meer. Wees voorzichtig met de DIN connectors en pluggen. Zet de speaker niet in een doorloop anders is de kans groot dat men er tegen aan loopt. Met grote kans op afbreken bollen………………stofzuigslangen en jasen aan trekken staan in de top 10. Gelukkig is de speaker niet topzwaar zoals de Lambda en Vifa serie. Controleer bij aankoop de connectors. Elke bol “sphere” bevat 2 ruggelings naar elkaar toe geplaatste domes die elk een halve bol van geluid afstralen. Bollen stralen 50 % naar voren en 50 % naar achteren. Niet zoals latere modellen zoals de Lambda en Viva deze zijn anders gefilterd. Beide halve bollen sluiten precies op elkaar aan omdat randen rond de membranen vrijwel ontbreken en de behuizing dus nauwelijks groter in middellijn is dan de membranen zelf. De afstralingen van de domes kunnen daardoor ook ongehinderd opzij in elkaar overgaan. De afwezigheid van randen of vlakken rond de membranen voorkomt ook reflecties of andere bijeffecten die het oorspronkelijke geluid vervormen of onnatuurlijk kleuren zoals bij traditionele boxen. Grote broer van de Lamda 3.
omdat hij topzwaar is valt hij meestal om met schade aan de bollen en vooral de connectors zijn in 80 % van de gevallen gescheurd. In de fotocollage is ook de Lambda 10 stofkap te zien die los verkocht werd. Tweeters zijn niet gezekerd (bij alle Magnaspheres) dus wees voorzichtig, stuk is stuk domes kunnen niet worden gemaakt wel vervangen. De bol van de 10 past op de 5 en 3 (bol van de 3 past alleen op de Lambda 3). Kenmerken zijn dat de Lambda 10 twee basspoort heeft aan de achterzijde. Let wel dat de tweeters in de bol anders zijn gefilterd. Dus beide tweeters klinken anders. Woofers raken vaak randen los, maar kunnen weer hersteld worden. 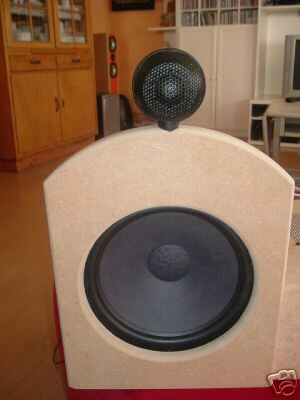 Nieuwe woofers misschien hier te koop. 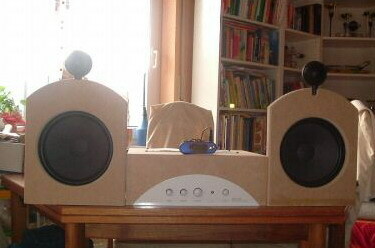 Een heel aparte speakers is dit. dit tot een zeer fraai klinkende speaker. Van heel fris helder hoog tot diep strak laag komt er uit dit wondertje. 9 van de 10 gevallen namen de bol mee naar huis.
! die het ook nooit leerde ging met de melkpakken de deur uit, maar daar was de chef erg blij mee…vette winst op de bose …………. 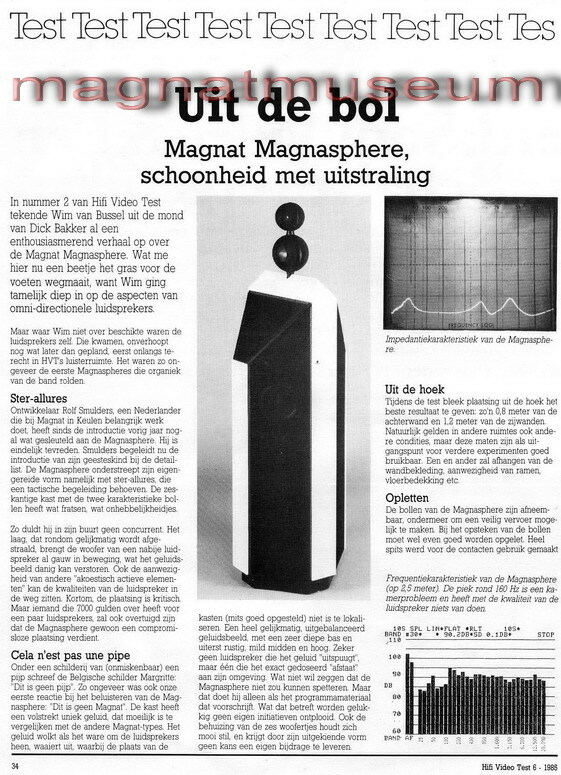 De kleinste Magnasphere van Magnat, maar met de grootste prestaties. Een compact klein speakertje met die eigenwijze kleine bol erboven op . 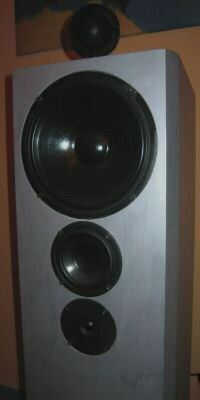 Ik gebruik de Lambda 3 in combinatie met de Heco Phalanz 10a subwoofer om het laag weer een 10 te geven. Dat resulteert en een unieke geluid ervaring. Het kleine “speakertje” met een geluid weergave van een gigant……..met tig luidsprekertjes rondom je. Heel fel en snel hoog en een uitgebalanceerd middengebied geeft je gewoon kippenvel………..
Plaats de 3 wel op steuntjes die iets schuin naar achter hellen voor een nog mooiere spreiding van het geluid. Alsof je rondom in speakers zit echt geweldig. Deze rondstraler heeft een zeer breed geluidsbeeld. Zeker voor zijn geringe afmetingen. Kenmerken zijn dat de Lambda 3 twee basspoorten heeft, 1 aan de voorkant en 1 aan de achterkant. De achterzijde meer geluid geeft dan de voorzijde. Belangrijk bij testen van de unit, zodat er niet is aan geknoeid. Het klankbeeld is zeer helder en plaatsing van de instrumenten zijn heel duidelijk. Hij heeft 1 woofer en twee tweeters. Waardoor het laag minder is dan zijn grotere broer. Daarmee krijg je een geluidsbeeld met een zeer strak laag. De woofer van fifa kan de rubberrand los raken. Opnieuw verlijmen is de oplossing. Alleen door naar deze set te luisteren begrijpt u wat ik bedoel. Nadelen is dat het laminaat aan achter en voorzijde los komt, dat komt omdat de speaker dan dicht bij de verwarming of een andere hitte bron (zon) heeft gestaan. Persoonlijk vind ik deze de mooiste van de Magnasphere serie, mits er een sub in het systeem wordt geplaatst TIP de Heco Phalanz 10a. Versterker Denon PMA-2000RIV Subwoofer Heco Phalanz 10A Denon DCD-1450 CD Night Noise. De twee tweeterdomes zitten tegen elkaar en vormen de boltweeter. Dan ontstaat er nog een extra ruimtelijk geluidsbeeld. Deze bol heeft een connector met een lipje die in de houder klikt. De bol past dan niet !!! in de andere Magnaspheres op de Collection 99 na. Lipje wegvijlen en hij past weer overal op. Let op dat de rand los gaat raken. Is weer heel makkelijk te repareren. Het simpele filter van de Lambda 3 met 3 MKT’s voor het verschil te maken in afstraling. Groen en bruin zijn op het filter aangesloten bij de MKT condensators.